Unlike unfriendly encounters selling door to door, Halloween is a magical time for kids Growin’ Up in Maine to get free candy. Social events at church back in the 1950’s are especially memorable like going to a Halloween party with cider and donuts. For some reason that combination of sweet and tart flavor still makes me smile. 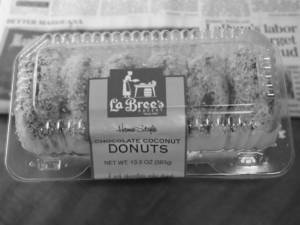 The donuts in the photo here are the LaBrees brand, and represent just one of their lines of top quality baked goods made in Maine. Food at parties included stale sandwiches slightly dried from being left out, and sometimes made with odd ingredients that I’d never eaten like cream cheese and grape jelly. Halloween parties in the 1950’s meant good clean fun with no tricks, just treats. Bobbing for apples was a spectator sport for sure. I tried, and did okay. It was more fun to watch. Yes, we dressed up as ghosts, goblins, or ghouls, plus super heroes, royalty, or cartoon characters. Trick or treatin’ door to door was our family tradition, yet the few times I opted for the church event was without regret. Good times. Great friends. Oh, and yes… cider and donuts.